The ice shell of Europa, a moon of Jupiter, is probably about 25 kilometres (15 miles) thick, according to scientists. Researchers created a profile of Cilix crater near Europa's equator, and taking into account the elastic properties of ice, estimated the thickness of the icy crust. Beneath this crust there is probably an ocean of water kept liquid by heat from Europa's interior, and protected by the ice shield for tens of millions of years at least. Many scientists believe that these conditions are right for life to begin, but at present there is no way to find out for sure. Many astronomers rank Europa along with Mars as the most promising places to look for life in our Solar System. 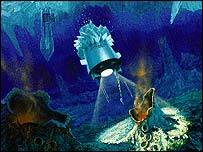 They believe that beneath Europa's ice crust there could be an ocean. If this is true, the implications could be profound. This ocean, possibly warmed by geothermal activity from Europa's interior, would be a protected and stable environment relatively unchanged for many millions of years. Scientists look at this combination of liquid water, energy and stability and wonder if life could have developed there. This means they are desperate for any data about the cold world. The Galileo spaceprobe that entered Jovian orbit in 1995 has finished its mission and will visit Europa no more. But the scientists have their dreams. First on their wish-list would be a Europa orbiter to take detailed pictures and radar soundings of the surface and what lies below. Engineers know that developing such a mission would be a tall order as getting a probe to Jupiter and then into orbit around the moon probably demands more from rocket propulsion technology than it can currently deliver. A Europa mission was being studied but the US space agency (Nasa) eliminated all funds for it in the 2003 budget. In its place may arise a new mission targeted at all the icy moons of Jupiter: Europa, Ganymede and Callisto. Nasa's Prometheus initiative was started earlier this year to develop new propulsion technology, including nuclear, for future space missions. The Jovian mission might be the first to benefit. Beyond even an orbiter would be a craft that would touch down on the icy plains and sample the surface. It would be an impressive and difficult mission. But what scientists would really like to do is to sample the liquid water that lies beneath the ice. This would involve devising a probe that could burrow its way through the crust, and the key question is: how thick is the ice? Estimates, or rather guesses, put the ice crust at anywhere between five and 100 km thick. Looking at one of the many impact craters that pock-mark the surface an international team of scientists writing in Geophysical Research Letters say that the ice crust is about 25 km thick. That is good and bad news: good because it is not 100 km, which would be almost impossible to get through, but bad because burrowing through 25 km of ice would still be a daunting exercise. The engineering basics of a Europa mole are being developed in the exploration of the ice-covered lakes of Antarctica, such as Lake Vostok. Lakes like Vostok, cut off for millions of years, may have unique creatures that have gone down their own particular path of evolution. 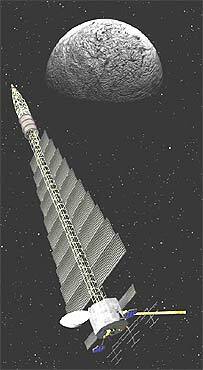 Vostok is hundreds of millions of km from Europa, of course, and life from the two places could be radically different. 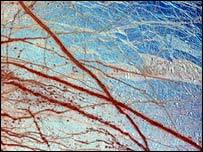 But the prospect of finding an ecology containing living forms which have developed elsewhere in space is so enticing that many scientists now regard reaching Europa's hidden ocean as one of the most important goals in Solar System exploration.